We had chili earlier in the week and the leftovers last night. Didn’t have any good crusty bread to have with it, so I worked on this cornbread recipe. I might not be the healthiest of recipes, but if you think of “moderation” then it will taste all the better. Grease a 9×13-inch baking pan or medium cast iron frying pan with bacon grease. In a medium sized glass bowl, melt butter in microwave at high for 45 seconds and let this cool a bit – then whisk in the buttermilk and eggs. Mix all of the dry ingredients in large bowl. Blend in wet mixture and the can of corn. Pour this into the prepared pan or frying pan. Bake for 25 minutes at 400 degrees until lightly browned and a toothpick inserted into center comes out clean. My daughter asked me for the Cincinnati Chili recipe that I usually make. This is supposed to be “Empress Style” i.e. Empress Chili Parlor. This was the second request in a week (my son asked for it last weekend) – so I figured I’d post it today. In a large pot, pour in 11/2 quarts of water. Add the tomato paste and the can of tomato sauce. Stir this around until all the paste is dissolved. Add the two chopped onions, stir, and then add in all the rest of the ingredients. The entire mixture should be somewhat loose when you start and then will thicken as it cooks. If it seems to thick to begin with add more water. Let this simmer on low or about three hours or until thicker. It smells great the entire time its cooking!! If it gets too thick and you don’t keep an eye on it, it will burn and you’ll have to throw it out! – so be careful dammit ! Cook pasta til done and drain. Place pasta on plates or pasta bowls and cover with Cincinnati Chili. Top with 1) dice white onions, sharp cheddar cheese, hot sauce (optional). Serve with oyster crackers is you want to. 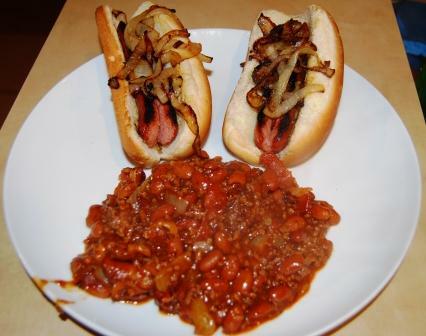 Chili Pups………In a hot dog bun – – – spread a little yellow mustard into the bun, scoop in some Cincinnati Chili, top with onions, cheddar cheese, hot sauce. YUMMMMM. Ok, it ain’t Saturday night yet! But I got this recipe for SATURDAY NIGHT BAKED BEAN SUPPER from the Cape Cod Today website (scroll about half way down and you’ll find it). The beans turned out swell! I can probably save some of it when Saturday actually comes around.